People are still trying to pass off the security video of Oliver as a trailcam video of a squatch. Does anyone know if they ever tested the nuclear DNA, or just the mitochondrial? The nuclear would be more informative. I found the abstract of the publication with the results of his chromosomal and mtDNA analysis, showing that he possessed 48 chromosomes, the normal number for a chimpanzee, and that the "results indicated a high sequence homology to the Central African variety of chimpanzee, Pan troglodytes troglodytes." But still if only the Chromosomes of the mtDNA were analyzed and not the nuclear DNA there are still unresolved questions from the paternal side of his ancestry. Since he was in captivity and could easily be accessed for sample collection I wonder why this data was not pursued as well? I would love to see a copy of the whole paper. Here is a link to the first article published which is cited in your link above Guy, but they don't have a courtesy copy of the abstract on view and you have to be a subscriber to the journal to log in and view it along with the whole article. The DNA study that tested Oliver's DNA was headed by John J. Ely. This man's background is worth paying attention to. He earned a PhD from Penn State in 1988 in Primatology. Then, twenty years later, he earned a degree from Mexico State U. in Epidemiology (the study of the way HUMAN diseases spread). Why do I mention these facts? Well, primate labs are the first place human diseases are tested . . . and developed (created). They also a great place to do gene splicing and GMO testing on primates. Hello? Duh. Ely's background is interesting to the point of verifying and yes, "clocking." I don't immediately trust the man's integrity. Why should I? Does anyone ever pay any attention to the possibility that DNA results could be falsified? Hello! If Oliver WAS a real experiment or some sort of genetically modified chimp, then of course the DNA results would be faked, and who better to call than a somewhat cryptic dude like John J. Ely. p.s. If you believe the pap about the double helix (DNA) being "discovered" by Crick and Watson I'll sell you a bridge in Brooklyn. James Watson is a ringer if I've ever seen one. Totally crooked and "whack." Think of it this way: if something is really important, it isn't externalized for at LEAST two generations. That's forty years, yo. What does this mean? 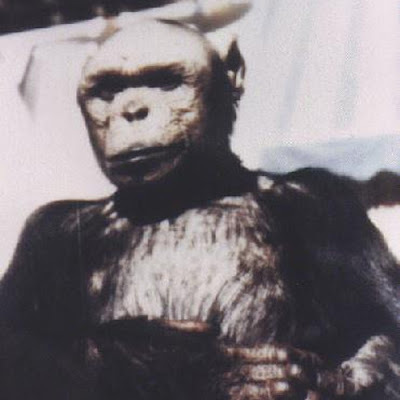 Oliver the Chimp was born in 1958. Most people would say that is way too early for him to be the product of genetic testing and experimentation. I would say it is the PERFECT time for him to be the product of GMO experimentation. Why? Because back then, there was no need to hide it from people. Nobody knew jack about it because the human genome hadn't been externalized by phony Nobel prizes and stuff like that yet and articles in Time magazine, yada yada. And since Oliver was born so early, nobody in the later part of his life would suspect him of being a test subject who was "created" by gene splicing, etc. These alleged test results deserve scrutiny from the standpoint of possibly being hoaxed. And, yes, John J. Ely is the perfect sort of guy down in New Mexico to be quietly developing a zombie virus to "cull" the human race down a few billion people in his primatology center in New Mexico. Back before WWII a Russia doctor, can't remember his name. became famous for gene splicing all kinds of animals and it's rumored he wanted to try human an ape, could Oliver be that experiment?